Combine the yogurt, strawberry preserves and honey in a blender and blend until smooth. Divide the strawberries evenly among four dessert dishes. Spoon the yogurt mixture over top of the berries. If desired, sprinkle with granola. Serve immediately. Whenever I go through the checkout line at the grocery store, I always wonder what the cashier must think of my purchases. A typical weekly shopping trip includes a couple bunches of bananas and enough yogurt for a small army. The sheer quantity of bananas and yogurt is what usually makes me wonder … especially since I live in a small town where it’s no secret that we are a family of four – including two small children. Honestly, though, the size and age of my kids shouldn’t fool you. They eat. A lot. If they so much as hear the familiar peel of the metal covering of a yogurt carton being removed, they come running to get some too. And really, until I had my daughter, I had never really thought of yogurt as a snack. Breakfast? Sure. Especially when I diet. But a snack? Never. However, without fail, Paige always requests yogurt as her preschool snack. She’s partial to smaller cups, packed with a juice box and spoon. At home, she likes to snack on yogurt too. And when it’s at home, I can really go wild with what we do with the yogurt. Forget about just a single-serve cup. When you buy a big tub of plain yogurt, it has endless uses. One of our favorites? Strawberries with Strawberry Yogurt Sauce. 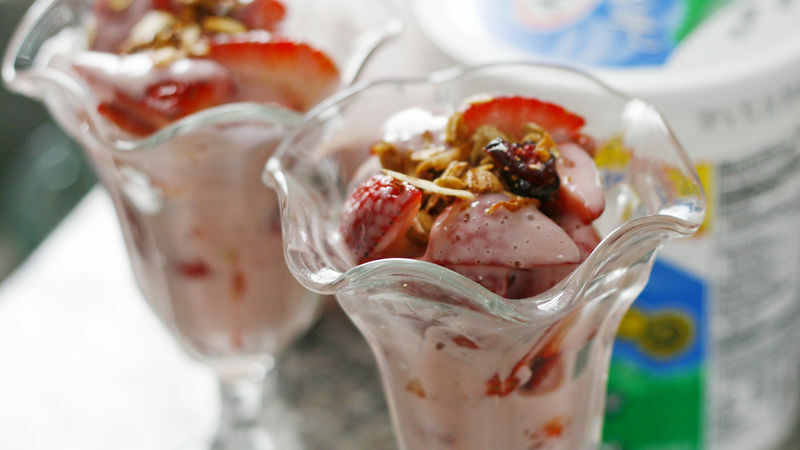 It’s easy as can be and combines the yogurt flavor that my kids love with one of my favorite fruits – strawberries. We eat it as dessert … but it could easily be breakfast too. How do you eat yogurt?